Image: Monica Schipper/Getty Images, pepifoto/Getty Images. Design: Kenzie Mastroe/SheKnows. An Ohio native, Amanda Kloots had moved to New York and danced in four Broadway shows before she decided to make a big career change. When she was 31 and after only three months of being in production in the show Bullets Over Broadway, Kloots got the news the show was closing and she would be out of a job. She decided to switch gears, take a leap of faith and open her own business — a fitness class that combined a jump rope and dance moves to create a fun and effective workout. Her classes began in April 2016, and now, celebs are lining up to get a workout in with Kloots. We were lucky enough to chat with this fitness guru to the stars, and she even let us take a peek inside her fridge. 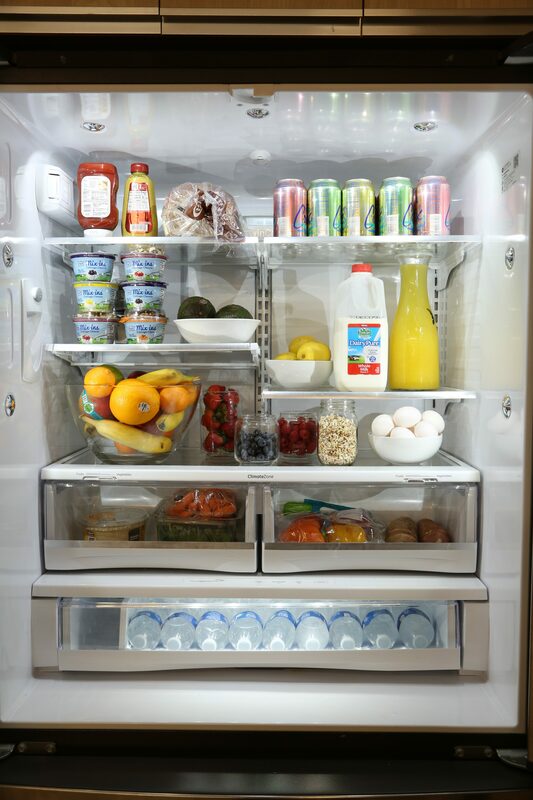 SheKnows: Tell us a little bit about what’s in your fridge. Amanda Kloots: I try to keep a pretty healthy fridge. It contains mostly fruits, vegetables, almond milk, cheese and delicious healthy snacks that I can have throughout the day. One of my favorite snacks is carrots and hummus. I love to stock my fridge with food that I can eat quickly because I have a busy schedule, so a lot of the time, I don’t have much time to indulge in a big meal until I’m home for dinner at night. Image: Courtesy of Amanda Kloots. SK: What about your freezer? AK: I always have cauliflower pizza crust in my freezer as well as ice cream. I usually will have a little ice cream every single night. I’m not a big frozen-foods girl. I like to eat fresh food and use fresh ingredients when I cook. SK: Are there any items you always make sure to keep in stock? AK: I always make sure to have apples, tortilla chips, Parmesan cheese and coffee creamer in stock. Those are my four staples. SK: What’s your go-to healthy snack? AK: My go-to healthy snack is banana and almond butter. Such a delicious snack! SK: We hear a lot of conflicting info about what to eat before and after workouts. What do you prefer to eat before and after an intense workout? AK: Before a workout, I like having my coffee! It may seem simple, but it gives me the energy I need to power through any sort of routine. It’s very important to refuel after a workout, and I like to do that with a protein-rich snack, like DairyPure Mix-ins Cottage Cheese. My favorite flavor is strawberries and almonds. It’s made with real fruit and nuts and comes in a convenient on-the-go cup, so it fits perfectly in my gym bag. SK: What’s one of the biggest misconceptions about healthy eating you’d like to clear up? AK: I think the biggest misconception about healthy eating is that you need to stay away from carbs. Carbs are good for you, and you need carbs in your diet, especially if you are working out a lot. You definitely should stick to healthy carbs, not white refined-sugar carbs. For some reason, carbs are considered evil in the fitness and nutrition world, and they are actually really beneficial to you and your body. SK: Can you give us an example of one of your favorite weeknight meals? AK: I love to come home and make a cauliflower pizza. It’s one of my husband and I’s favorite things to do together. I love topping it with spinach, sun-dried tomatoes, mozzarella cheese. Sometimes I will put sauce on it, and sometimes I will just put olive oil on it. It’s a great way to have your pizza in a healthy way. SK: What would you consider the ultimate comfort food? AK: My ultimate comfort food is my mom’s macaroni and cheese. It’s made with real cheese, real milk and real pasta, and it’s absolutely delicious! SK: Any foods you absolutely can’t stand? AK: One food I just can’t get into is oysters. They seem so appealing too, because you are sitting down with your significant other or a group of friends and they pair well with a glass of wine. However, I’ve tried them several times, and really want to like them, but they just aren’t my thing. SK: What’s the strangest food you have ever eaten? AK: I tried snails not too long ago when I was teaching classes in Paris. I wasn’t blown away by them but knew I needed to try them at some point in my life. SK: Would you eat them again? AK: I probably wouldn’t eat them again. If I’m going to sit down and eat something, I want it to be something that I really like. For example, if someone offers me a bite of their food, I probably wouldn’t take it unless I really loved the food. If snails were on the table, I’d probably have a bite, but I wouldn’t order them again myself. SK: What food trends do you think will be big in 2019? AK: I think cauliflower is going to become even bigger in 2019. I feel like we’re seeing the food everywhere these days, from cauliflower crust to cauliflower gnocchi. I think, overall, we will see an increase in people indulging in their favorite comfort foods but in a healthier way. We’re spoiled in New York and Los Angeles because we have a lot of healthy options here. However, I think we’ll see these healthy trends become more prominent in Middle America in 2019.